I am a relatively recent oatmeal convert. I wouldn’t touch the stuff for most of my life unless it was baked into a cookie. But back in college I tried eating oatmeal for breakfast and it slowly started growing on me. Since then, I have enjoyed trying oats in all kinds of dishes. There’s still cookies, of course. 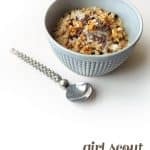 For breakfast, this Girl Scout Oatmeal is definitely a favorite. But oats aren’t just for breakfast and dessert anymore. Oats are an incredibly versatile ingredient and I love that about them. You can use them in so many recipes. 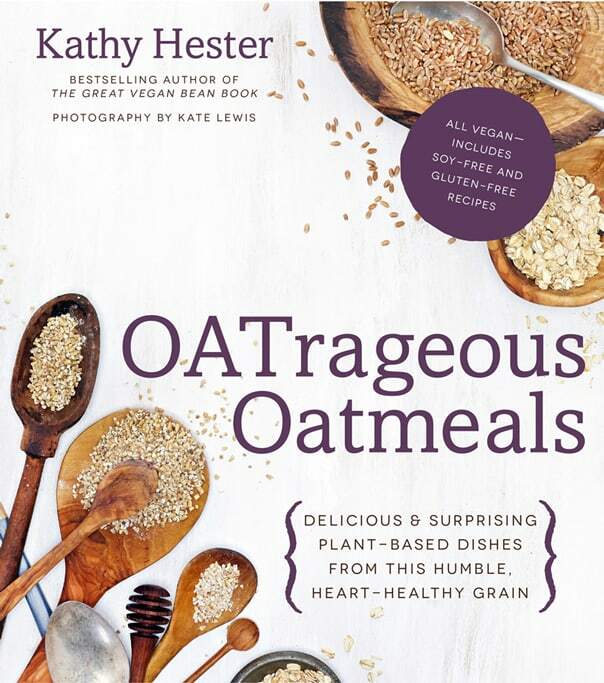 After reading OATrageous Oatmeals by Kathy Hester, I am even more convinced that oats are magic. Kathy finds very creative, out-of-the-box ways to use oats in familiar recipes — even drinks! I am really excited to introduce you to this awesome new book and to give you a chance to win it for yourself. Inside OATrageous Oatmeals you’ll find ways to use this grain in everyday dishes. Every single one is vegan, and many of the recipes are soy-free, lactose-free and gluten-free. Kathy’s book has so many delicious-sounding recipes I want to try, both savory and sweet. I’m stoked about the Chickpea Veggie Soup and Veggie Oat Taco Mince. Who would have thought you could put oats in tacos?! I’m also intrigued by the Blackberry Mojito Overnight Oats. I love recipes that you can make ahead and eat on the go. To me, though, the best surprises in this book are the liquid recipes. There are several for homemade coffee creamers, like Coconut Vanilla Nut Creamer. How cool is it that you can sweeten your coffee with water infused with oatmeal? Definitely going to try that. 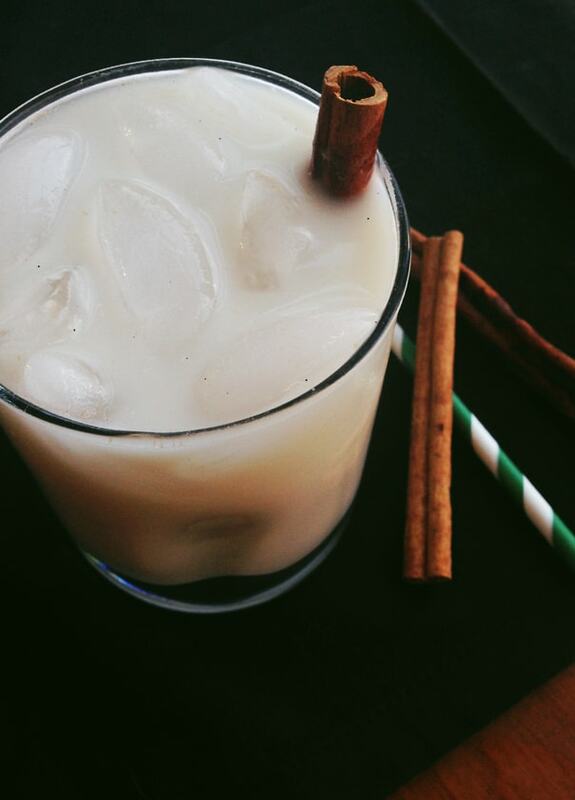 And then there’s this Oat-Chata. 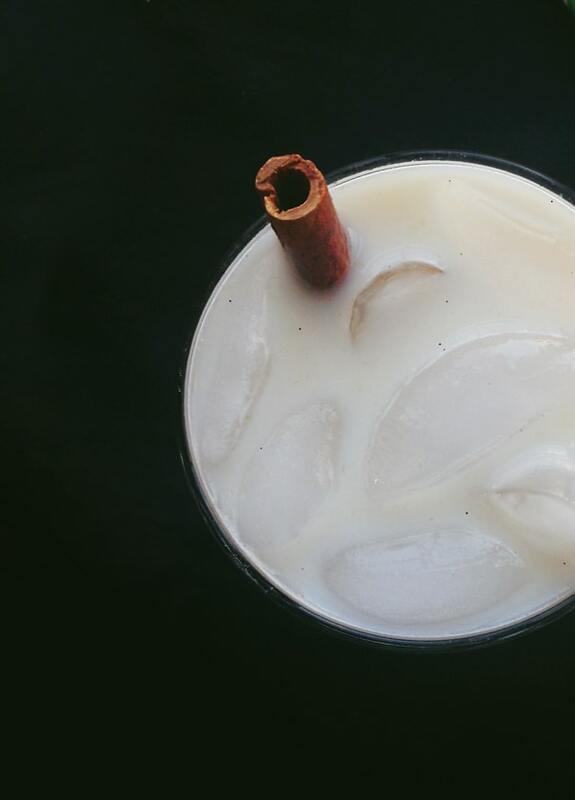 Kathy’s spin on Mexican horchata — made with cinnamon, rice, oats and almonds — is so beautifully delicious. I am lactose intolerant, and as much as I love dairy, I really shouldn’t consume it. Many recipes for horchata infuse rice with cow’s milk, but this version omits the dairy altogether. 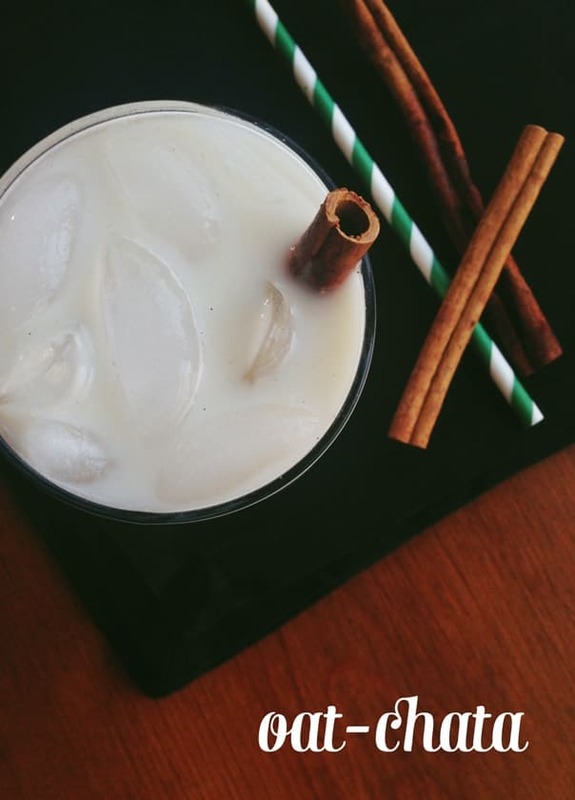 This lactose-free version of horchata is absolutely perfect for someone with dietary restrictions like me. The giveaway is open until Monday, Dec. 22, 2014 at 10 a.m. EST. One winner will be chosen at random within 48 hours. Winner must claim prize within 48 hours of initial contact. The retail value of the prize is $19.99. Prize includes one copy of the cookbook. Open to U.S. residents only. Must be 18 years of age as of Dec. 12, 2014. I was provided with an advance copy of the cookbook and the recipe has been printed with permission of Page St. Publishing Co. 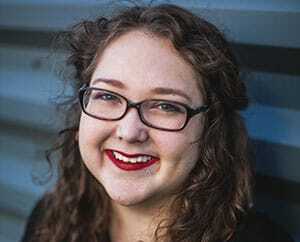 This post contains affiliate links and I will receive a small commission if you make a purchase after clicking one of them. All opinions are purely my own. Thank you in advance for supporting Feast + West! Click below to see the recipe! 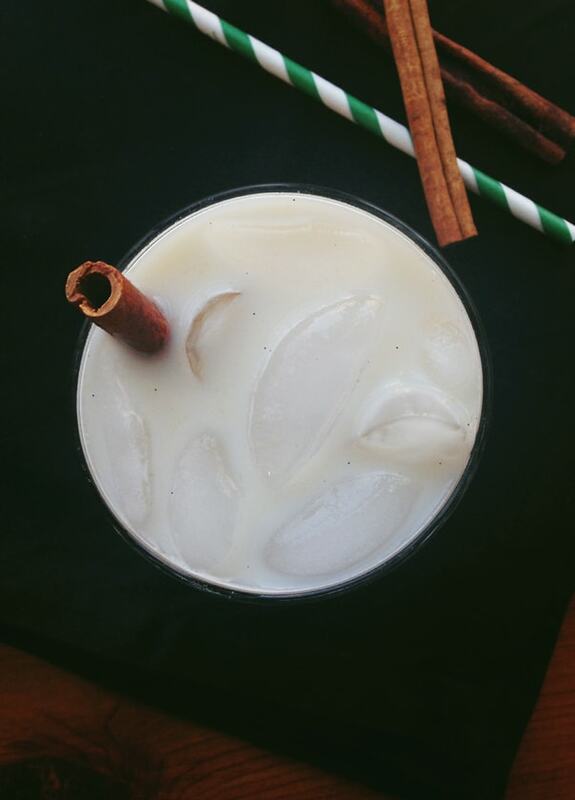 Horchata is a traditional Mexican beverage made with homemade rice milk, cinnamon and sweeteners. I’ve taken liberties with it here by adding in oats and almonds. It’s amazing served over ice and is the perfect drink for a hot summer day. I have to admit that I went through my first batch in a day—it is just that good. Consider yourself warned. Maybe go ahead and make a double batch. almonds, rice and cinnamon. Soak overnight or between 8 to 24 hours. Once the soaking time is up, remove the cinnamon sticks and pour the mixture into a blender. Blend for 1 to 2 minutes or until most of the particles have broken down. Strain through a small mesh strainer into a bowl with a pour spout. Rinse the blender and strainer. agave, vanilla and stevia and blend well. Store leftovers in the fridge. Serve over ice. I used my favorite sweetener combination and encourage you to do the same. Just blend the milk with a touch of your sweetener, then taste and add more if necessary. **For zero waste in this recipe, save the pulp you strain out of this milk and cook it with about 1 to 2 cups (235 to 475 ml) of water over medium heat until the rice particles become soft. 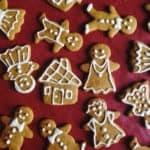 I like to eat it as a breakfast with a little sweetener – yum! 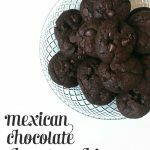 Mexican Chocolate Chocolate Chip Cookies + KitchenAid Mixer Giveaway! My fav oatmeal recipe is for oatmeal raisin cookies! I have a recipe for Buttermilk Oatmeal Pancakes that is very good! The night before you soak 2 Cups of Oats in 2 Cups of Buttermilk. I love steel cut oatmeal, PLAIN, with a little butter and Stevia! I like to make steel cut oats on the weekends. Thank you for the giveaway offer! Apple crisp or really any fruity oatmeal bars or crisps. My favorite oatmeal is steel cut in the crockpot overnight, with some apples or peaches thrown in with cinnamon. It’s so crazy simple, but so so so good!! My favorite is granola, I like to eat it by the handful or toss atop yogurt. 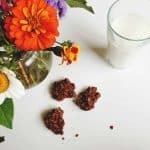 I love oatmeal raisin cookies but would like to try other recipes too! Oatmeal raisin cookies are my favorite! But I would love to try some new recipes! My favorite oatmeal recipe is Blueberry Oatmeal Muffins! I got the recipe from Betty Crocker and have made them for years! Love them so!